Features sharp contrast for lines and cells. Central square is ruled into 25 groups of sixteen squares, with each group separated by triple lines. The chamber is made of one-piece thermal and shock-resistant glass, with double Neubauer rulings in the two counting areas. The rulings patterns are 1/400 mm and cover 9 mm. Comes with counting chamber, two diluting pipets (RBC and WBC), two cover glasses, and two rubber tubing aspirators with mouthpieces. 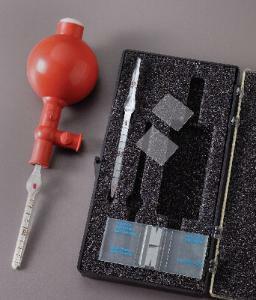 This set is supplied in a polyethylene case.